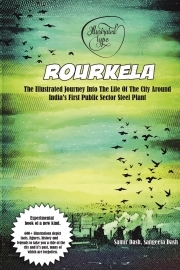 Description of "Rourkela - The Illustrated Journey Into The Life Of The City Around India's First Public Sector Steel Plant"
Completely illustrated narrative about Rourkela, a city that become one of the iconic industrialization urban symbol in post independent India. A remote village of the ‘Roulia’ tribe, surrounded by dense forests and hills amidst India’s one of the mineral rich valleys, got selected by the makers of modern India to host India’s first public holding Steel and Iron company Hindustan Steel Limited. This story is the the journey of becoming one of the founding stones of modern industrialization of India. culture and the impact of urbanization in social life. An unique experimental book of it’s own kind. Samir Dash is a techie from Bangalore, India. He has authored a number of books namely "Beginners Guide To Modern Critical Theory" and "UX Simplified" etc. Sangeeta Dash, occasionally writes on socio-cultural and literary topics. Reviews of "Rourkela - The Illustrated Journey Into The Life Of The City Around India's First Public Sector Steel Plant"